GENERAL SANTOS CITY, Jan 14 (PIA) -- Local Government Units (LGUs) in Mindanao need to scale up its disaster risk management capacities in light of occurrence of series of natural calamities that struck the island's danger prone areas. 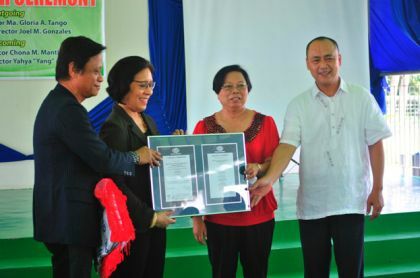 The Mindanao Development Authority (MinDA) recently convened recently concerned agencies to come up with programs to strengthen the capacities of Mindanao LGUs in disaster preparedness and response to avoid a repeat of loss of lives resulting from the recent spate of natural disasters that hit Mindanao. MinDA chair Luwalhati R. Antonino initiated discussions on the current capability of Mindanao’s local government units to interpret information, anticipate needs, and prepare against natural disasters and manage risks. “What I’d like to see is for us to map out a program of what needs t be done and coordinate to help the LGU’s in their efforts of prevention, mitigation, and adaptation,” Antonino said. Director Ronald Flores, executive officer of the Office of Civil Defense (OCD) pointed out that more than response, rehabilitation, and recovery, the LGU risk management focus must now be more inclined to prevention, preparedness, and mitigation, such as in foreign countries like Japan. Flores said that while LGU’s have their contingency plan, some of them are wanting in the aspect of implementation. Thus, there is a need to take stock of the level of preparedness of the LGU’s being the primary disaster managers. Dr. Marquiesa Reyes, also of OCD central office, noted that geo-hazard mapping is just the first step, stressing the importance of identifying current areas of vulnerability and the adverse effects of tropical storms. She further noted that more important in the planning is to focus on increasing resilience of settlements and the people against effects of natural calamities. The inter-agency body agreed on building and sharing accurate and updated data, particularly 3-D maps using LIDAR technology, including a protocol of analysis of data, for circulation to all local government units. Antonino emphasized the need for a more intensive information and education campaign among the LGU’s on interpretation of storm signals and information on what authorities need to do to prepare against such calamities. She cited the existing program of the National Disaster Risk Reduction and Management Council (NDRRMC) as a basis and called on the involvement of more agencies. The coordination meeting was also held as part of the validation of activities under the “MindaNOW! Nurturing Our Waters” program of MinDA, a river-basin and watershed management program that also seeks to institutionalize the LGUs capacity building and strengthen their planning capabilities on environmental sustainability.